While I was moving house and waiting for my internet to be reconnected, multiple works of mine came out! I’m trying to catch up now. My poem is in wonderful company: this issue features work by Seanan McGuire, Kat Howard, Maurice Broaddus, Mary Robinette Kowal, Cassandra Khaw, T. Kingfisher, Aliette de Bodard, Sarah Gailey, Dimas Ilaw, Sam J. Miller, Alasdair Stuart, Joyce Chng, Shevta Thakrar, Cleto, and Chloe N. Clark; the cover is by Kirbi Fagan! I hope you check this issue out. 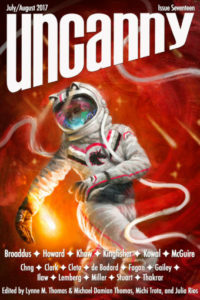 Uncanny Magazine is running a Kickstarter to fund their fourth year, which will include a special double issue of Disabled People Destroy Science Fiction. I am offering a Birdverse reward, a bespoke story/vignette for $250. It will involve an autistic protagonist, perhaps even Dedéi Brentann from Geometries of Belonging. I hope you check out the Uncanny/DPDSF kickstarter! Finally, my surrealist unclassifiable RETRYING came out in Daily Science Fiction. It is very short and very strange. I’d love to hear what you think.